What’s your dream car? Is there a specific model, brand, color car you promised yourself you would own one day? I used to say mine was a Ford Thunderbird, the “Eleventh generation” (2002–2005) one. I don’t know what it is about it, but that car always made me go “Wow!”. I love my SUV now though, so if I had the chance I’m not sure I’d buy the Thunderbird. My sister’s dream car has always been the Corvette. She has wanted one since the 80s I believe. This past summer, she found a used red one and fell in love. She happily traded in her SUV for it and sent us all pictures of her new “baby”. 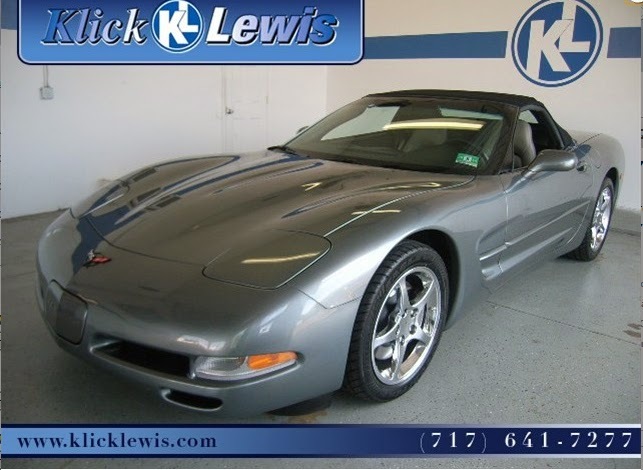 While browsing Klick Lewis Cars of PA‘s website, I decided to look up their Corvette’s and they have some really fantastic options. You can get a brand new 2013 Corvette of course, but the used options have really low mileage and a great price to match. There is a 2004 Corvette, 2 door convertible, with 8,215 miles for $30,000. Yes, I said 8,215 miles. I was pleasantly surprised by all of the options. If, like my sister, your dream car is a Corvette, check out Klick Lewis! This post was sponsored by Klick Lewis. All opinions are 100% my own.